John Stewart passed away on Saturday, January 19, 2008 after suffering a major stroke a day earlier. John will live forever in our hearts through his music. For the past 40 years, John Stewart has told the story of America in the Twentieth Century. Through his writing we have met many unique individuals ranging from little Ludi and E. A. Stuart to Angel Delgadillo. Each of these individuals becomes an Everyman and through their eyes we see the dreams and sometimes the frustrations of a country "trying desparately to remember itself". John's songs provide a looking glass into our national soul and it would not be surprising if, a hundred years from now, anyone studying the people of America will be directed to start with the songs of John Stewart. John's recording career began in the 1950s with his own garage band, The Furies. He started writing contemporary folk music in the early 1960s and formed a group called The Cumberland Three. In 1961, John replaced Dave Guard as a member of the Kingston Trio. He brought a different feel to the Trio and his distinct voice and style added to a number of the Trio's hits such as "Where Have All the Flowers Gone" and "Greenback Dollar". In 1967, John left the Trio to pursue a career as a solo artist. His initial recording, "Signals Through the Glass" with Buffy Ford was followed by his landmark masterpiece, "California Bloodlines". Since then he has recorded over 40 albums, cassettes, and CDs. John is featured prominently in the new show "The Kingston Trio: Wherever We May Go" currently airing on Public Television stations in the US. His most recent CD "The Day the River Sang" has just been released by Appleseed Records. John has written hit records for other recording artists like "Daydream Believer" by the Monkees and "Runaway Train" by Rosanne Cash. His own major hits include "Gold" (with Stevie Nicks and Lindsay Buckingham), "Midnight Wind", and "Lost Her in the Sun". 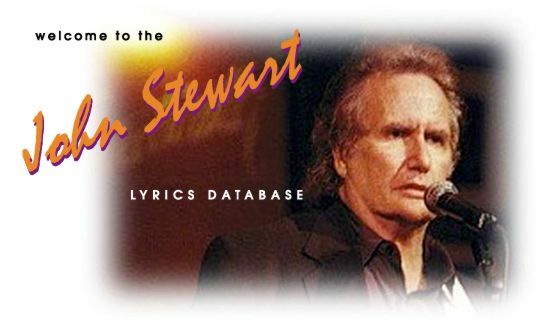 The purpose of the John Stewart Lyrics Database is to make all of John's writings available to his fans in a form that is easy to search and read. This database is comprehensive and there is a wealth of lyrical treasure here. It includes all of the songs that John has recorded in his solo career and all of the songs that he wrote during his days as a member of the Kingston Trio and the Cumberland Three. You will find the lyrics to all of the hit records and the favorites here as well as the words to some songs that John never released. Enjoy it all. A Brand New Feature of the John Stewart Lyrics Database is the addition of Guitar Tabulature for many of the songs in the database. Currently about half of the songs have guitar tabs and more will be added. The guitar tabs are the result of the hard work of Art Faller, Charlie Woodward & Jan Hauenstein with some additional help from Ken Swaitek and others. So all of you fans who have requested this feature in the past now have a searchable resource at your disposal. Each year Bob and Bobbie Shane host a Kingston Trio Fantasy Camp in Scottsdale, AZ. If you would like more information, simply click on the "Fantasy Camp" button below. All of the photographs of John Stewart featured on this site are © Howard Bruensteiner. All Rights Reserved.